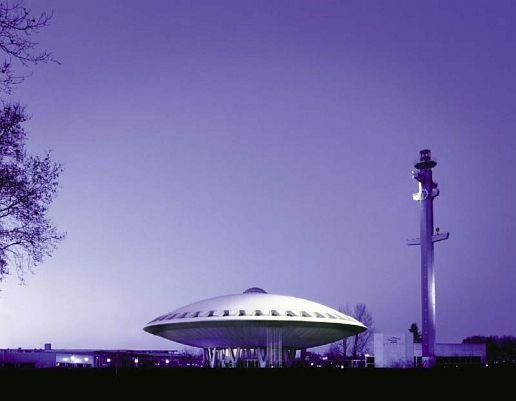 The building shown here is the "Evoluon". It can be found in the city of Eindhoven, the Netherlands, where it was erected in 1966 to celebrate the 75th anniversary of the Philips corporation, the well-known manufacturer of electronics products. For decades, the Evoluon was a unique architectural sensation in Europe. Initially it was built to house the Man and Progress Museum, which acquainted visitors in an amusing, interactive way with the past, present and future of science and technology. In the 1970s and the first half of the 1980s, the Evoluon drew half a million visitors a year. When the concept began to run out of steam, the Philips corporation decided to turn Holland’s most famous building into a conference centre for the Philips divisions. In 1998, the futuristic structure once more opened its doors to welcome a larger public, this time as a luxury commercial conference facility. The new formula proved to be a success.